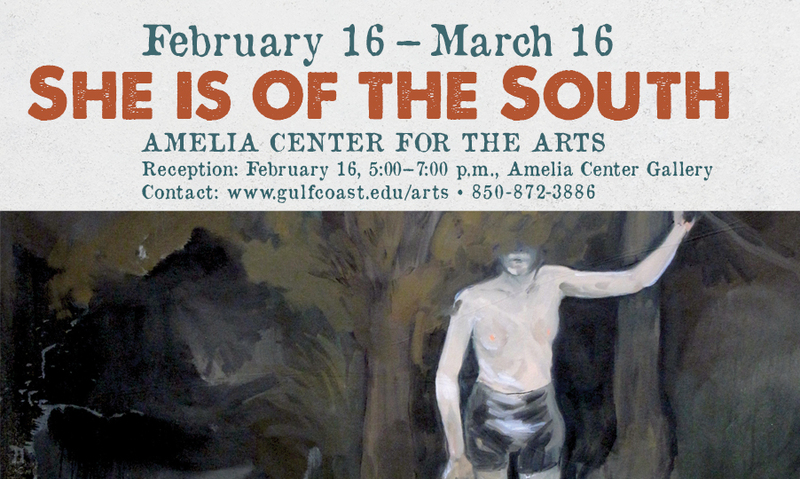 Panama City, FL – The Visual & Performing Arts Division of Gulf Coast State College is excited to present “She is of the South,” a group exhibition featuring work by Carrie Ann Baade, Inga Kimberly Brown, Katelyn Chapman, Hannah Hill, Norah Lovell, Holly Ann Scoggins and Lauren Woods. The show features work by women who were raised, or live, in the South and whose work reflects a sense of Southern identity. There are many different ways to express Southern identity and each artist provides her own unique interpretation, but there are a few constants. One is family, or multi-generational understanding of family, with a complicated history, deeply rooted in the land. Another is tradition, a certain way of doing things as they have always been done, which could be empowering or ensnaring. Finally, they share spirituality, whether dogmatic or mystical, or somewhere in between. All of the artists share a narrative, often autobiographical, approach to painting. While the stories are different, they share a sense of mystery and bittersweet nostalgia that is particularly Southern. The exhibit will be on display in the Amelia Center Main Gallery (Room 112) February 16 – March 16. An opening reception will be held the evening of February 16, from 5:00 – 7:00 p.m. in the Gallery. Admission is free and open to the community for all of the above. For more information, please contact Pavel Amromin at pamromin@gulfcoast.edu or 872.3886. This entry was posted on February 9, 2018 by 850music in Posts and tagged press release.